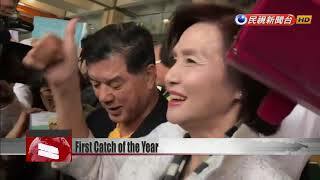 The first bluefin tuna caught this year in Taiwan's waters was sold this morning at a live auction in Yilan County. The massive fish weighed in at 210.8 kilogram and was sold for NT$1.475 million Taiwan dollars. The "first bluefin of the year" auction is a long-standing tradition that celebrates the giant fish, which is highly prized for its taste but under threat from soaring demand. From the fishing boat’s cargo hold, a massive bluefin tuna is lifted out in front of a cheering crowd. The fishermen scrape out ice from the belly of the fish before they weigh it. It’s 210.8 kilograms, which meets the 180 kilogram weight requirement for the “first bluefin of the year.” The fish, which was caught by a boat based in Su’ao, was weighed and immediately put up for live auction. Yilan County Commissioner Lin Zi-miao served as the auctioneer. The bidding was fierce and rose to NT$7,000 per kilogram before the sale. It’s our first bluefin won at an auction. We’ll offer it to our guests to sample. The higher you bid, the more money fishermen get.